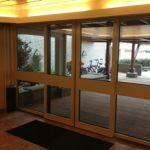 At the 3 beautiful apartment buildings right on the coast (next to Huis ter Duin) in Noordwijk, the existing manual doors had to be replaced with automatic sliding doors. 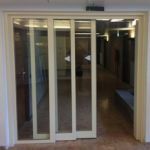 Since the existing window frames were also in need of replacement, we worked in cooperation with the façade builder so that the front doors were able to close in the evening. 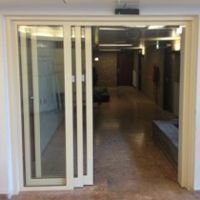 For the front doors three automatic two-wing front doors are used with behind three automatic telescopic in-door doors.